Guantanamo Defense Lawyer Resigns, Says U.S. Case Is 'Stacked' One of the lawyers for self-proclaimed Sept. 11 mastermind Khalid Sheikh Mohammed resigned from the Army last week. He tells NPR the government is putting on a "show trial." Jason Wright, seen here during his 15-month deployment to Iraq, served in the military for nine years before resigning last week. 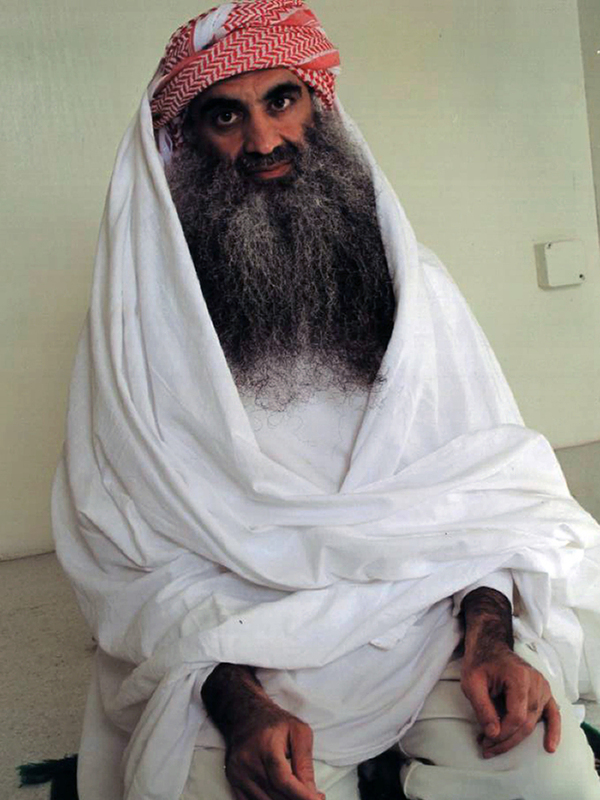 Khalid Sheikh Mohammed, the self-proclaimed mastermind behind the Sept. 11 attacks, is facing a military commission at Guantanamo Bay and potentially the death penalty. He was captured in 2003 but his case still hasn't gone to trial. 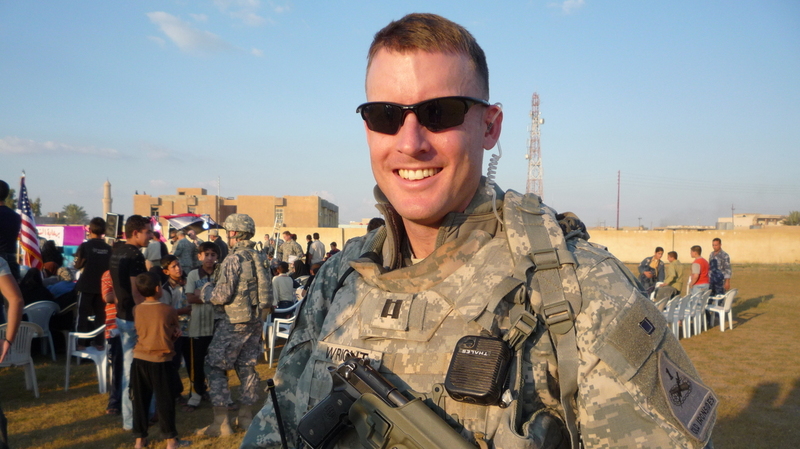 Last week, Maj. Jason Wright — one of the lawyers defending Mohammed — resigned from the Army. He has accused the U.S. government of "abhorrent leadership" on human rights and due process guarantees and says it is crafting a "show trial." Wright joined the military in 2005. He served 15 months in Iraq during the surge and has worked as a Judge Advocate. For nearly three years, he served on Mohammed's defense team. Khalid Sheikh Mohammed has claimed to be the mastermind of the Sept. 11 attacks and multiple attempted attacks against the U.S.
Wright formally resigned on Aug. 26. Earlier this year, the Army had instructed him to leave the team in order to complete a graduate course that was required with his promotion from Captain to Major. He refused the order; he says it would have been unethical for him to have followed it. Wright tells NPR's Arun Rath that it's hard to gain any client's trust, but it was especially hard with Mohammed. His former client is one of six "high-value detainees" being prosecuted at Guantanamo for offenses that could carry the death penalty. "All six of these men have been tortured by the U.S. government," he says. Wright says Mohammed in particular has faced a level of torture "beyond comprehension." He says his client was waterboarded by the CIA 183 times and subjected to over a week of sleep deprivation; there were threats that his family would be killed. "And those are just the declassified facts that I'm able to actually speak about," Wright says. Given that treatment, Wright knew it would be hard for Mohammed to trust him. "You show up several years later and you say, 'I'm from the U.S. government and I'm here to help you' ... and you add on the complexity that I wear the same uniform as the guards," he says. "It's very challenging in any situation to develop trust and confidence with a client. But when you add on that torture paradigm, it's all the more difficult." Wright wasn't allowed to discuss too many details of the detainee abuse in court. He references a recent Foreign Policy article by Laura Pitter, of Human Rights Watch, about the notion of "original sin" and how it's complicated terrorism cases. "The 'original sin' being the fact that the CIA tortured these men and that they've gone to extraordinary lengths to try to keep that completely hidden from public view," Wright says. "So the statute that Congress passed has a number of protections to ensure that no information about the U.S. torture program will ever come out." He says there are additional constraints on the defense teams that have made it hard to operate — including allegations of listening devices disguised as smoke detectors in attorney-client meeting rooms. "So not only do you have statutory design, but you actually have, in practice, a very large effort to try to ensure that no ensure that no information about torture is ever made known in public," he says. The hardest thing to deal with as a defense layer, he says, is fighting the government's influence. "The U.S. government is trying to call this a fair trial, while stacking the deck so much against the defense and the accused that it can hardly be called a fair trial in any system in the world," he says. The larger strategic implication for the government, he says, is that it gives a license for the rest of the world to torture and "set up secret military courts outside of public review and outside of due process. "Leave aside our constitutional principles — which we should try to uphold irrespective of who the defendant may be — the Constitution has been completely stepped on throughout this entire process," he says. "That's a separate and distinct issue of how the U.S. now has shown just abhorrent leadership when it comes to actually following essential, fundamental human rights and due-process guarantees." Wright says it doesn't matter what happens at trial; the government likely won't release the defendants even if they are acquitted. He contrasts it with the Nuremberg trials after World War II, where the chief prosecutor promised Nazi war criminals would be set free if they weren't found guilty. "We have a system where if someone's acquitted, they will not be set free," he says. "That is actually the very definition of a show trial." Earlier this year, the Army instructed Wright to leave the team in order to complete a required graduate course with his promotion from Captain to Major. The course can be deferred for a variety of reasons; Wright had already deferred once. But his latest request for a deferral was denied without explanation. "So really I only had two choices," he says. "I could either accept and voluntarily leave my own self from the case and my obligations to my client. Or I could refuse the orders." He decided would be an ethical violation to abandon his client voluntarily, so he refused the orders. "And when you refuse the orders, you have to resign from the Army," he says. Wright served his last day on Mohammed's defense team; he formally resigned from the Army on Aug. 26. He believes his departure will be very disruptive to the Mohammed case and potentially the other defense teams. "Here you have government attorneys who tell a defendant, 'I'm your attorney, I'm here to help you, and I'm going to be here 'til the end.' And half-way through this process, the U.S. government — the same government that tortures you, the same government that's trying to kill you, the same government that provides the public defender — now gets to control when defense attorneys come and go," he says. Mohammed's legal saga has stretched out for years — he was captured in 2003 but the government didn't bring charges until 2012. Wright says he can't speculate how long it will take for a trial to start. "The Judge Advocate General denied the second deferral request because a suitable and competent military defense attorney replacement was available, Major Wright was not the lead or sole counsel, and it ensured Major Wright remained professionally competent and competitive for promotion." "The prosecution has never listened to a single attorney-client communication, and no entity of the U.S. government is listening to, monitoring, or recording attorney-client communications at the detention facility in Guantanamo Bay." However, there are ongoing investigations into allegations that the FBI attempted to make a member of a detainee's legal team into a confidential informant. The government also disputes Wright's claim that the proceedings amount to a show trial, saying, "The on-going detention of Khalid Sheikh Mohammed is fully consistent with the law of armed conflict, and that detention is reviewable by petition for habeas corpus in United States federal civilian court." They also point to the convicted detainees who have served out their sentences and returned to their home countries.